Brother International Australia has recently announced their new business focused A3/A4 colour inkjet device, providing a revolutionary solution to all ink woes. 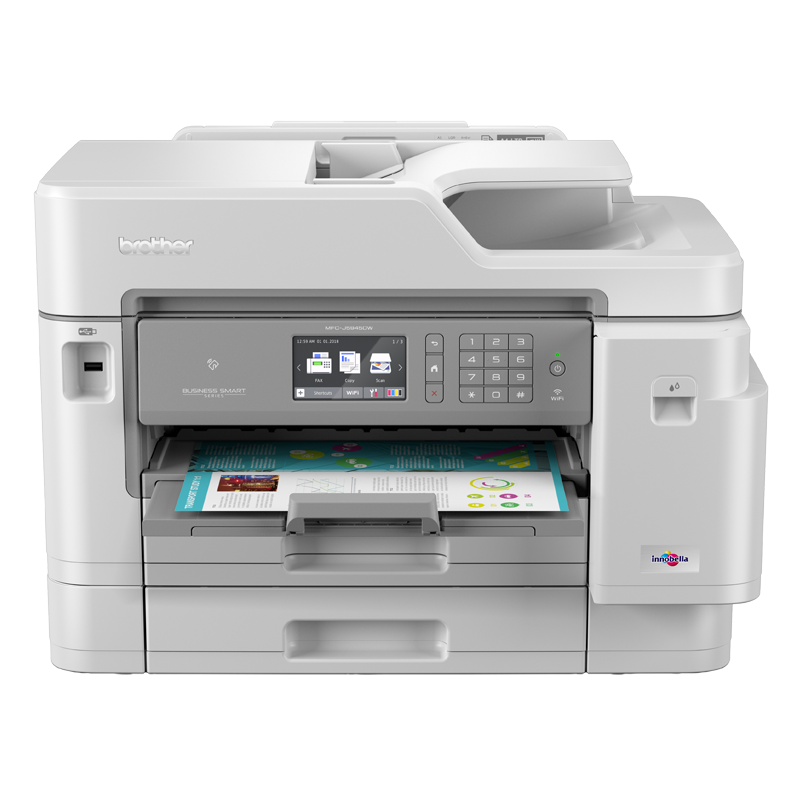 As well as encompassing all the features of an all-in-one multi-function inkjet printer and with new re-engineered INKvestment Tanks, the MFC-J5945DW is the most economical printer in its class, significantly lowering costs for your business. Brother’s innovative INKvestment Tank re-engineered Inks and internal ink storage tank, help to deliver a noticeably higher number of printed pages. The MFC-J5945DW’s super high-yield inks provide up to 3,000 pages1 in black and up to 1,500 pages1 in colour in-box, with the same yield replacement cartridges available exclusively via Harvey Norman. Complemented by truly uninterrupted printing of up to 22ppm2, businesses can generate fast, high-quality prints at a very low cost per page. With a particular focus on office environments printing 300-3000 pages per month, having a solution that not only integrates seamlessly with the organisation’s existing technology, but also reduces the need for maintenance and attention, can be an effective way of relieving workflow bottlenecks. Implementing balanced deployment in your printing solution, by finding a device that caters to the needs of multiple staff members, but also relieves the pressure of maintaining the device, improves productivity and opens up opportunity for staff to focus on what’s important. 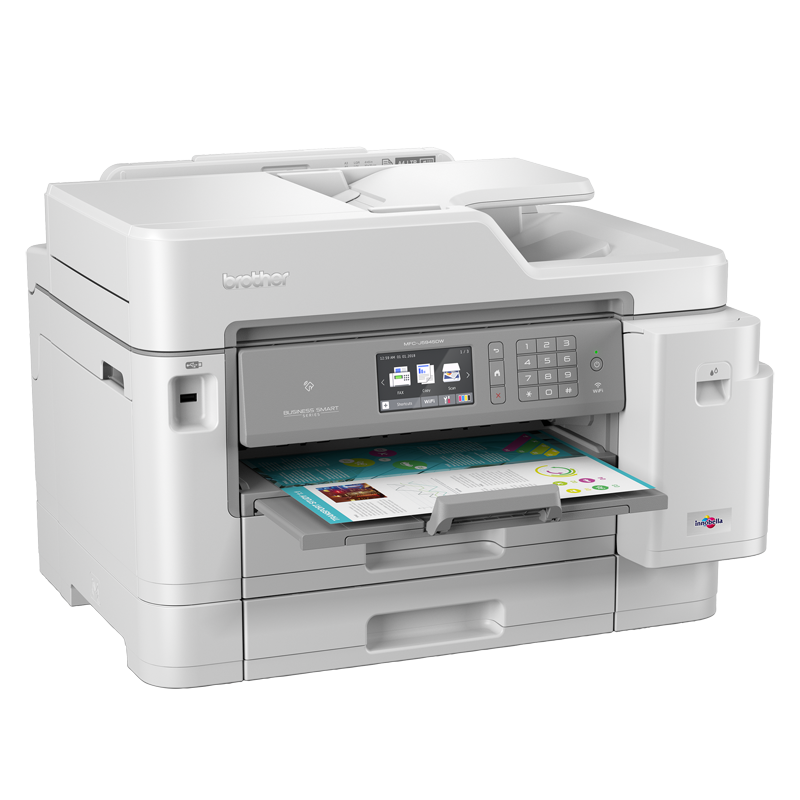 The MFC-J5945DW is designed with connectivity and ease-of-use in mind, allowing users to print and scan wirelessly from a desktop, laptop, smartphone or tablet. Alternatively, users can take advantage of the Near Field Communication (NFC) connectivity function; a “one touch to connect” feature that facilitates easy connection for both mobile printing and scanning. As no network set-up is required, this acts as the ultimate time saving feature. In addition to versatile paper handling with A3/A4 printing, the MFC-J5945DW is packed with practical feature including a 50 sheet Automatic Document Feeder (ADF) and a user friendly 9.3cm touchscreen interface. Duplex print, scan and copy also helps to reduce wasted paper. This stylish-yet-robust device comes in a crisp white colour and seamlessly fits into any busy office space. Built with hardwearing materials and supported by outstanding service, it’s designed to go the distance. Brother’s award-winning3 reliability allows the delivery of uncompromised performance at all times.